Unfinished Projects - …you have to be crazy to work here. 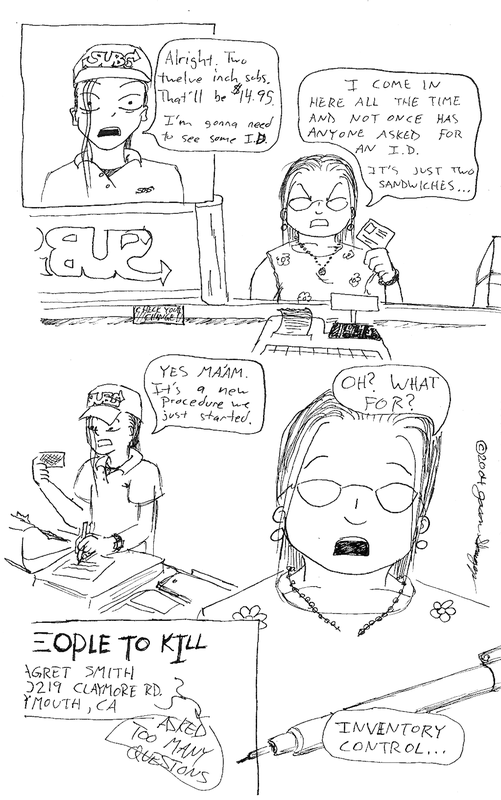 This is another of those classic things-I-really-did-at-Subway comics. Although, this one was sliiiightly modified. In reality I never wrote the names down and I usually laughed at, and refused IDs when they’d hand them to me. Still, it was loads of fun late nights on weekends before closing because they never quite knew if I was being serious beneath the haze of alcohol surrounding them. This is ALSO one of those never-before-seen comics. I had to cut apart one of my sketchbooks to bring it to you! Where Fresh is the Taste? It’s the way a sandwich should be. Its where fresh is the taste. Its home to a possessed ice machine and the legendary “evil” parmesan topping. This is Subway, where the employees will always greet you with a smile (or at the very least a smirk) and your food is always fresh when you order it…mostly. On this particular day, I was greeted by “Chuck,” a hockey-masked, machete-wielding employee. Chuck, of course, is actually Jason, a good friend of mine. He was making sandwiches as usual, but since today was Friday the 13th, he had gotten permission from the manager to dress up for the occasion. Most of the customers could care less that they were being served by Chuck, but a few of them stared and stayed on their side of the counter, instead of leaning over to look at the choice of veggies, like they usually would. According to Jason, one customer, upon seeing him dressed as “Chuck,” leaped back and muttered a phrase that would make your mother blush. “Its customers like that that make Friday the 13th and Halloween all the more enjoyable,” he told me. Apparently, Halloween had come early this year. I sat down in the back of the store, hoping for a quiet place to just look around and take in the scenery. Instead, I found that it was not quiet at all. The ice machine, which is supposedly possessed, emits an annoying high-pitched whine and drops ice at random times of the day. When I went to investigate, all I heard was the whining of the machinery and the loud whirring of the fan blades above me. Maybe I just came at the wrong time of the day. The only other employee in today was Bryce, a former Infantryman in the US Army. he’s being trained to close the store at night, a job that was offered to me a few weeks ago and that I politely declined. Bryce is much quieter and less apt to dress up on days like today. He’s also quicker to scream “Go away!” when he sees people drive up to the store, whereas Jason simply grumbles and goes behind the counter to prepare for their orders. Today, though, there weren’t very many customers so Jason and Bryce simply took turns serving customers while I sat and watched. Jason, dressed as Chuck, presents the customers with a (fake) severed foot and asks if they’d like a six-inch or a “foot” long. Some customers laugh, but others are too busy staring at the menu to notice. He cuts the bead as usual, unless the customer is especially “zombified,” as he puts it, in which case he pulls out a machette (cleaned and sanitized, of course) and “sacrifices” the sandwich to a random god or demon. “Once, a customer jumped back and screamed bloody murder,” he told me later. “Then he laughed and I finished making his sandwich.” Jason tells me that these are the customers that make dressing up for Halloween and Friday the 13th more enjoyable. I can’t imagine why. Since I’ve started coming here more often, I’ve noticed that the store is usually pretty empty unless a football game is going on at the high school across the street. Most of the customers are out-of-towners or regulars who are stopping by to get dinner on their way home from work. Jason describes the football games as “evil. We’re usually too busy to finish one sandwich before we’ve got customers ordering fifty more for the kids on the field or in the band.’ On a “normal” day, like today, there aren’t many customers coming in. They reminded me of sheep in the way they showed up-they saw one person in the store and suddenly remembered that they wanted a sandwich too. Soon, there would be a line of about five or six people waiting for sandwiches. While Jason and Bryce busied themselves serving customers, I took the liberty of investigating the smell by the back door. It turned out to be the bathrooms. The back area isn’t much different from any other Subway, but it smells funny enough though its been cleaned twice already today. Of course, the smell isn’t coming from filthy bathrooms, its coming from the countless bits and pieces of food from sandwiches and bags of chips that have been brought into the bathrooms. No one knows why people take their food into the bathrooms. It’s a mystery better left unsolved. The back door itself has changed quite a bit. A few years ago, it was simply a steel door with a deadbolt lock in it. Now, it has about five locks and chains going up and down the left side. Jason tells me its because someone broke in one night last year. Once the customers have been served, Jason and Bryce resume their seats at the table in the far back of the store. The topics range from everything from football games to the new breads, bad customers to bad haircuts and everything in between. Today, the conversation roamed from one about a particularly bad employee, to one about paperwork, and then one about the manager. Nothing escaped their conversation, not even the ice machine. Apparently the manager hadn’t cleaned the nozzles well enough so Jason had to clean them again. “It was just gross. I was wondering why everything tasted weird.” It’s a gross thought, but not at all uncommon in the fast food industry where there’s slime in everything, from ice machines to grease fryers. Today, you see everything from pierced eyebrows to full-body tattoos in the workplace. You may not always see an employee wearing a hockey mask sacrifice your sandwich to some random demon (most likely made up on the spot). And you’ll probably never see what he has to clean up in the bathrooms when the store has been closed and the customers have all gone home, but then, why would you want to? Marr0w_Productions started off as a bit of a pipe dream. Finding it’s origins back in ’96 with the creation of the Shrine of Akira, my goals towards creating a fictional cult and making it as real as possible led me down many strange paths. Coupled with an obsession with computers this was literally what opened the doors for me when it came later to web development (and an unhealthy amount of email addresses). I tried the [I MAKE WEBPAGES] bandwagon for the longest time but it got me nowhere. Either someone would offer to get me hired onto a place and would take the job for themselves or I’d be ignored completely. I even voluntarily remade existing ‘auto-generated’ webpages for people in hopes they’d be impressed with my style and run with it to get my name out. Saddly this also didn’t get me far. It wasn’t until the online gaming community TwistedMUCK (then ChronoMUCK) was created that anyone acknowledged the name as anything more than an over glorified email address. And shortly after that the Petting Zoo videos began. Now the name is tied to a rather vast number of projects and my solo efforts have umbrellaed out into a small number of people with like-minded goals and similar levels of sarcasm. There was a point to this and it involved explaining why so many projects have come and gone since our outdated blog was replaced with this one, but in hindsight maybe it’s better to simply leave it at that. Maybe I’ll get around to making that point later as an excuse to post again. While I’m fond of new players coming onto our humble MUCK, I do feel a bit of trepidation regarding them at times. Especially when they decide to say they’re things like “Furry” or “Pokémorph/mon”. I’m an avidly vocal opponent of these kinds of characters/players, due to the general populace of their fandom being overly vocal, whiny, or just downright rude. There have been very few exceptions to this generalization, yet they are so few and far between, it becomes extremely difficult for me to discern the difference between the two. This is brought on by coming home from work, and reading over my backscroll (A backscroll for the uninformed is the buffer of events that is displayed on screen in my MU* client from the period I was inactive until I was active), to discover that we do in fact have a new player, and seemingly from the information in their character profile, fall within the “Pokémorph” category. This concerns me slightly, as from past experience, the community with these people are less then tolerable unless they are within their own element. Coupled by the fact that they have stated in their character profile, they are of a species of Pokémon from the upcoming 5th generation of games, which hasn’t even been released yet. There has been no On-Screen proof of what this type of Pokémon is capable of, or where it will fall within the upcoming Power Scales of the yet to be released game. This kind of behavior worries me, as this could prove to be an issue in the future, especially if this new person starts doing things based on the fact that this new species of Pokémon hasn’t even been shown yet, so they are ‘assuming’ that it should get this or that. Some may wonder why I feel this warrants a rant, however, its because I can rant about it on this space, that I choose to do so. As a general rule of thumb. I don’t like Furries and Pokémorphs at all. They generally cause more headaches then really ever needed or desired. Many Staffers of MU* games can attest to this fact, and unless they are within a game that is themed towards their specific niche, they will cause a lot of problems.